There are different subtypes of FTD and the symptoms of each subtype can be very different from one another. All the symptoms interfere with day-to-day life but in different ways. As you learn about the disease and what other teens have experienced, you will likely find common threads to help you understand your experience. A doctor diagnoses a type of FTD based on the symptoms that are seen earliest and that are most noticeable during the first two years. Someone may experience symptoms in one or all of these areas: behavior and personality changes, difficulty speaking or understanding words, or trouble with balance or walking. As the disease progresses it affects a person’s ability to work, enjoy family and friends, and carry out daily activities. The frontal lobes of the brain are the parts that control how well a person can plan, organize and make decisions. This part of the brain also controls social behavior. It helps us know what is considered “socially acceptable” and how to act in different situations. For instance, if the frontal lobes are healthy, you know to speak differently with your grandmother than you do with your friends. The most common first symptom is apathy. Apathy is often mistaken as depression. The clinical diagnosis for this type of FTD is behavioral variant FTD (bvFTD). It is also sometimes called frontotemporal dementia or Pick’s disease. Behavioral variant FTD is the most common form of FTD and it affects about 60 percent of people with an FTD diagnosis. Inappropriate actions (i.e., talking out loud during a church service; touching strangers, cursing, sexual comments, urinating in public). Someone with this type of FTD may begin to do things that are very out of character. A shy person may become talkative and outgoing; an accomplished professional may receive bad performance reviews at work. The person may do fewer activities with you and others, or may stop wanting to do anything at all. They may say rude or mean things they never said before, or spend money carelessly or ignore routine safety when walking or driving. They may express feelings of anger or sadness more often. There are many things you can do to help a person with FTD to make them more comfortable. High levels of noise, activity and crowds are usually difficult for someone with FTD because it becomes difficult for them to process the stimulation. Choosing quieter places and activities helps to reduce behavior symptoms. Many people with behavioral FTD are not aware of the changes in their personality or actions and trying to convince them won’t help. Don’t argue. Pause. Take a deep breath and try a different way around the problem. Dealing with someone who has behavioral variant FTD requires patience and understanding. However, some people with FTD may develop aggressive behavior. Verbally or physically abusive behaviors are very serious and should not be tolerated. Speak with a trusted adult and get help to address aggressive behavior that is directed toward you. More tips for managing behavior symptoms are listed on the “Types of FTD Chart” here. About 30 to 40 percent of people with FTD experience symptoms that affect their ability to communicate. The person can be very smart and have a great vocabulary but when FTD is in the part of the brain that controls language talking, writing and understanding language become harder. This type of FTD is called primary progressive aphasia (PPA). It starts with changes in how a person talks or in the words they use. Language is a very complex process and there are different ways the disease can affect language skills. Diagnosing PPA and the specific type of language problem requires specific neuropsychological and language testing. Doctors have identified three subtypes of PPA. A person with PPA may have symptoms from all three subtypes, which can make it even more difficult to diagnose. Someone with nonfluent/agrammatic PPA (nfPPA) may know the right word, even for something simple like a plate or clock, but not be able to find it or use it when needed. They may have trouble saying a full sentence. They might ask, “You like green shirt?” instead of “Do you like my new green shirt?” They may not understand the meaning of sentences and have a hard time answering your questions. And they may talk less or get angry or frustrated trying to tell you something. When the right temporal lobe is more affected, people in early stages may have trouble remembering faces of people who were once familiar to them. Eventually the degeneration of either side of the brain will progress to the other. Basically, the person with logopenic PPA (lvPPA) has trouble finding the right word in conversation and has lots of hesitation or pauses while speaking. They speak slowly and may repeat words or phrases several times in the same conversation. A person with this variant may also have trouble understanding a long, complex explanation or description and the condition often ends with them becoming completely silent. When someone has PPA, both you and they can use various strategies to make it easier to communicate. Speak slowly, and use less complicated words and sentences. Use facial expressions, gestures and pictures of objects to help them understand what you are trying to communicate. Your family might consider contacting a speech and language therapist (a heath care professional specializing in communication disorders). He or she can show your family how to use additional techniques to maximize communication. More tips for managing language symptoms are listed on the Types of FTD Chart. Progressive supranuclear palsy is a movement disorder in which a person has a particular difficulty controlling and coordinating eye movements that makes it hard for them to look up or down. This can cause loss of balance and make walking a challenge. People with PSP may also experience slowness and stiffness of movements, problems swallowing or speech difficulties. They may eventually not be able to move at all. Corticobasal syndrome is a movement disorder that can cause slowness of movements or rigid movements. It usually affects one side of a person’s body. It may also cause tremors (when a leg or arm constantly shakes in short, jerky movements) or abnormal postures of the body. It is also referred to as corticobasal degeneration (CBD). Approximately 15 percent of patients with FTD will also develop motor neuron disease (MND). In FTD-MND, physical problems develop along with the thinking and behavior symptoms of behavioral FTD. Initial physical symptoms may include muscle weakness in arms and legs, muscle twitches or cramps, slurring of speech, and difficulty swallowing. These symptoms eventually progress to a point where the person is no longer able to move or speak. Someone with FTD-MND may start to walk or move more slowly, have trouble holding objects like a fork or glass of water, trip more easily on stairs or uneven areas outside or have trouble swallowing when they eat or drink. This subtype is also called FTD with ALS (amyotrophic lateral sclerosis, or Lou Gehrig’s disease). People with movement disorders do better in an environment that is free from clutter and has room for them to use canes, walkers or a wheelchair. Physical therapists know how to assess muscle strength or weakness and use exercises or suggest adaptive equipment to make getting around easier. For more information on the symptoms of the different types of FTD and what you can do to help, click here . My dad never used to watch much television. Now, since he got sick with FTD, he watches TV almost all day and loves to watch the same movie over and over again. He’ll watch a movie two or three times in the same afternoon and then the next day, watch it again. I get so tired of hearing the sound track for that movie I wear my headphones around the house to block it out. I just wish he could enjoy doing something different. 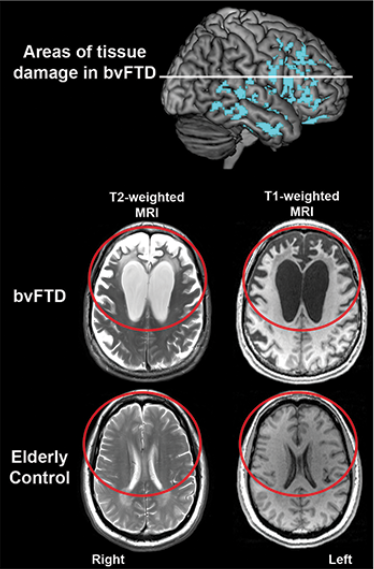 These MRI images show the area of the brain that is affected in bv FTD. The areas circled in red are the frontal lobes. The areas that look folded or wrinkled are brain tissue while the solid areas are empty. You can see the atrophy caused by bvFTD when you compare the images to healthy control. 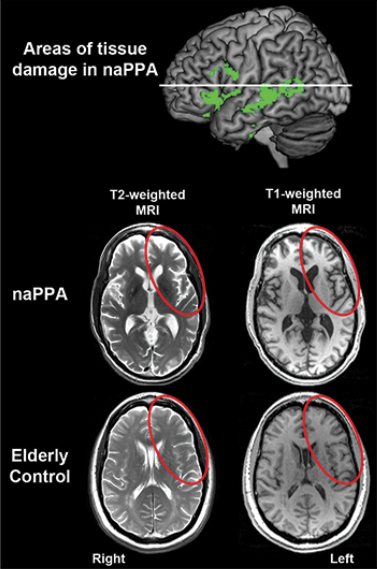 These MRI images show the area of the brain that is affected in svPPA. The areas circled in red are the right temporal lobes. You can see how much less tissue there is in the person with svPPA compared to the healthy control. About a week ago, my family decided my father should use a wheelchair. His muscles are so stiff and his left leg shakes all the time, so he can’t walk around safely. His balance is bad and he falls. The last time he fell, he really injured his head. He needs lots of help getting in and out of the chair but we’re lucky that our house doesn’t have any steps. He’s only 49 years old.